This page discusses issues in the design of the Kamikaze Images web site. I examined several other web sites that present academic topics in history, literature, and anthropology in order to identify effective design characteristics for this site . My first large web site (Friendship Dolls) contained some design errors, such as inconsistent menus, fonts, and page layouts. Based on this experience, I spent much time planning the design of this site to ensure I did not repeat these mistakes. Organization - This site uses a strict hierarchical structure to organize its contents. This assists readers to find information classified under specified topics. During site development, I changed the organization several times to better fit the topics addressed by individual pages. My goal is to add information to this site well beyond December 2004, the deadline for submission of this final project required for my MA in Liberal Studies degree at Wesleyan University. Therefore, I tried to construct a hierarchy that will allow new pages to fit into existing web site categories. For example, one of the six categories under the various forms used to create kamikaze images is labeled "Other Forms." This category allows me to find a place for new information not considered when developing the original site. Hypertext - Hypertext is the presentation of information as a collection of pages with links between them. Readers can move between pages in a non-linear fashion based on available links, which provide multiple options for exploration within a network of numerous pages and links. Many people experience disorientation when reading hypertext. Conklin (1987, 38) describes this disorientation problem, "Along with the power of being able to organize information much more complexly comes the problem of having to know (1) where you are in the network and (2) how to get to some other place that you know (or think) exists in the network." No perfect solution exists for this disorientation problem, but I included several design features in this site to lessen confusion. Each web page has the same header and left-hand menu system, so someone arriving at any page will recognize the Kamikaze Images logo at the top left and be able to click on it at any time to go to the home page. The top and bottom of each page have a bar to show the page location in relation to the home page. This bar includes links to any higher-level page in the hierarchical path to the home page. Search engine results or links from other web pages allow readers to start at any page on the web site. As a result, I tried to write the site content in such a way that readers can get necessary information from the first page visited. For example, for a person who wants to read a review on a particular book or film, I tried to write the review page in such a way that the person does not need to read any other pages on the site. This leads to some repetition of background information not required in a standard linear essay. One of the presuppositions in hypertext, particularly when applied to education, is that linking materials encourages habits of relational thinking in the reader. Such intrinsic hypermedia emphasis upon interconnectedness (or connectivity) provides a powerful means of teaching sophisticated critical thinking, particularly that which builds upon multicausal analyses and relates different kinds of data. At the beginning of my research, I found it difficult to make connections due to the complexity of the history of Japan's kamikaze operations. As I learned more about the history and about different types of images people have about kamikaze, I started to identify many relationships between information provided by books, films, museums, letters, web sites, and personal interviews. Navigation - Although the left-hand expanding menu and the bar at the top and bottom of each page provide some navigation capabilities, this site includes several other features to assist in finding information. The top right of each page has a Google search box that allows searches of the site based on key words. The Site Map lists in hierarchical order all pages on the site. In addition, there are additional categorizations of web pages in individual sections such as Books and Museums. The page on Recent Changes allows previous visitors to go directly to new web pages they have not yet viewed. Layout - Many web sites today use a page layout with a standard header, menu on left-hand side, and page content in the remaining space. This layout has several advantages, including standardization of the menu and header for all pages on the site. Most sites with this type of layout have a small logo and name at the top left with a link to the home page, so I adopted the same convention for this site. Many sites use narrow columns for page content, but I decided to use most of the available space on the page to allow photos to fit comfortably with a normal size window. Colors and Graphics - When considering the color scheme for this web site, I recognized immediately the need to stay away from any shade of red in order to avoid association with blood or the Japanese flag. I tried to select neutral colors that would not influence visitors' opinions about kamikaze. This site's color scheme of white and shades of blue comes from an internal web site at my company, but I have found several large commercial and educational web sites with a very similar color scheme. The placement of graphics generally follows a consistent pattern throughout the web site. Most pages start with a graphic at the top right of the main contents area. Multiple graphics on a single page generally alternate from right to left as the text goes down the page. Other than the site logo at the top left of each page, I have avoided use of custom graphics. 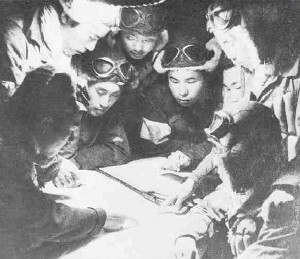 Instead, I try to give an objective presentation of images related to kamikaze, primarily historical photos, current photos of places and items related to kamikaze, and copies of works being reviewed such as book and video covers. 1. I reviewed the following five academic web sites in January and February 2004 in order to determine effective design characteristics for this web site on Kamikaze Images. Conklin, E. Jeffrey. 1987. Hypertext: An Introduction and Survey. IEEE Computer 20: 17-41. Landow, George P. 1997. Hypertext 2.0: The Convergence of Contemporary Critical Theory and Technology. Baltimore: The Johns Hopkins University Press.